Here begins the practical path that I have anticipated since the release of The Glorious Burden over three years ago. Naturally after getting this magnificent record that laid to rest my fears that Iced Earth couldn’t be as awesome as they were with resident throat-god Matt Barlow, I couldn’t wait to hear more. On this EP we have the first snippets of IE head honcho Jon Schaffer’s gruelling odyssey to give musical birth to the extended story line started on the Something Wicked-trilogy back on Something Wicked This Way Comes. The aforementioned trilogy is on this EP in a completely rerecorded form. The tunes have been recorded on baritone guitars so the overall sound is darker and heavier than on the original. Schaffer’s picking is deadly accurate and crushing as always. Returning skinsman Brent Smedley flurries on the drums like it’s 1998 all over again and the rhythmic parts are airtight. As far as the compositions go, not much has changed in the songs or melodies. Birth Of The Wicked and The Coming Curse are nearly identical to the old versions with some variations in the choral singing in the latter. Prophecy has been mellowed out a bit as some of the pre-chorus parts are now backed by hand percussions like tambourines and congas, which give the song an ominous, tribal feeling. Personally, I like this variation very much as the laid-back percussions meld in nicely with the heavy metal blistering. Schaffer has hinted that there will be more of these atmospheric elements on the coming full-length albums, which sounds brilliant to me. Now, the breaking point for many will of course be the vocal work. Tim Owens puts his own flavour to the original tunes here and the results are technically flawless, and most likely awesome/mediocre depending on your stance in the absence of Barlow. The Something Wicked-trilogy is a devastatingly gruelling set of songs to sing again even considering IE’s catalogue, as I feel this trio really let Matt Barlow stretch his divine vocal range to the maximum from smooth, soothing crooning to furious growls and ear-piercing wails. Needless to say, Ripper hits the soaring high notes perfectly, with mighty force and anger. The harsh lower parts are well executed as well (damn I love Owens’ awesome vibrato), and it is only in the melancholic, moody parts, where I feel Ripper doesn’t reach the level of the originals. Then again, in my view no singer in metal, any given decade, could match Barlow in sheer emotion and feeling (on second thought, make a tie with him and Warrel Dane of Nevermore). Everything I have said so far in this paragraph is obsolete if you are unfamiliar with the original recordings of the Something Wicked-trilogy. If so, this trio on this EP is a vicious streak of thematically interwoven heavy metal-awesomness that could fill thrice as many songs with fabulous riffs, melodies and great storytelling. Of course, one must give good points to the entirely new song, the actual single that will appear on the upcoming album. Ten Thousand Strong starts off with a steamrolling guitars/drums-blast as Owens lets forth a murderous wail that nails your attention squarely at the speakers. The riffing is relentless and the chorus infectious as hell – a definite delight to play live in my mind. Overall a very typical fast IE-song, heavy and magnificent, although it didn’t follow the "verse-semichoruswithguitarsplayingthevocalmelodies-verse-chorus"-structure that I’ve come to love from this band. 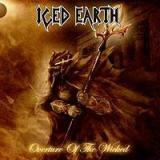 Overture Of The Wicked quenched my thirst for new Iced Earth-material only momentarily, and the direction on this disc is seeming very good in my mind. If possible, I am waiting for the new double album even more. As risky as it is at this point, my Album Of The Year-stamp is still heavily inked for this special package. We will soon see if my anticipations pay off, as I am confident they will.